Trust ADW Diabetes we take pride in our prompt service and quality oral healthcare products. You'll save money on oral care and enjoy fast delivery. 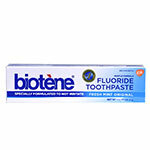 You will find that all the top brands like Biotene and Xylitol at discount prices. So browse through our wide range of oral hygiene and trust us for best prices and service.